When Jay was born in May 2009 Caroline and I were only the second couple among our extended group of friends to become parents. In world-historical terms 28 wasn’t young to be having a first kid, but in our peer group it felt a little like we’d taken to the frontier. Things have changed since then. A couple months ago I spent a weekend in South Carolina with some college friends. Our first night there we were out at a bar, playing pool and drinking pitchers of Dale’s Pale Ale, when one of the guys gathered us all around to announce that his wife was pregnant with their first kid, due June 3. Euphoria ensued. Then when things had settled down another guy said “Actually, I have an announcement, too.” Pause. “June 2.” Pause. “Twins!” Pandemonium. So, 2012 is shaping up to be a bumper crop of babies in our social circle, which for comparative purposes, is comprised almost entirely of white, college-educated people born in 1980 or 1981 (making them 30 or 31 today). 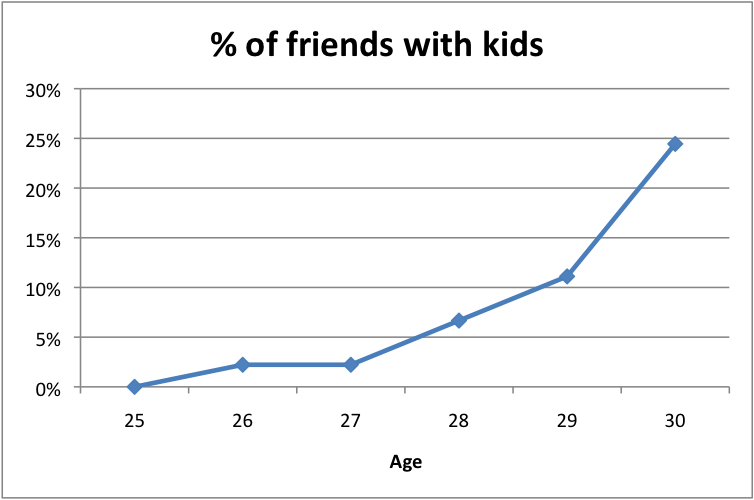 With Caroline’s help* I put together a graph showing the percentages of our friends with kids by age. Out of 45 friends, only three people (6%) had kids by age 28. Five people (11%) had kids by age 29. Then a big jump at age 30, when 6 people had kids, bringing the total number of parents to 11 (24%). I didn’t include age 31 in the graph because the year is still in progress. But we have several friends who are set to deliver their first kids at age 31 and several more who have told us they’re trying to get pregnant- so if anything, age 31 stands to be an even more fertile year than age 30. Overall, the average American has his/her first kid at age 25. Among people with college degrees, the average woman has her first kid at age 30 and the average man has his first kid at age 32. Among women with a bachelor’s degree, about 24% won’t end up having children. *I should note that Caroline’s involvement in this post is limited largely to helping me figure out how to use Excel. She’s not at all complicit in the methods I used to construct the chart, which are not quite up to snuff in the eyes of a demography PhD. This entry was posted in Sociology of the Family by Kevin Hartnett. Bookmark the permalink. Interesting post, Kevin. Nearly 26 years ago, my husband and I were the first in our circle of friends to have a child, and I was 32 at the time. My husband was 33. That seemed odd to me at this time—-maybe our circle of friends was just the beginning of this type of phenomenon! In 1967 I was serving in the US Army in W. Germany. I was 25 when our first son was born in the Army Hospital in Nuremburg. My wife was 24. That son is soon to be 45 and his first born just celebrated his 8th birthday. My other son was 32 when his daughter was born in September of 2002. Times have changed in America. I wonder whether there’s currently a small swing back towards having kids earlier. My anecdotal sense is that people my age are way more into the trappings of marriage- big engagement rings, big weddings- than people a generation ago, and less into convention breaking overall. I wonder if this embrace of ‘traditionalism’ spills over to having kids earlier. Dunno. You might also like the article I mentioned in my comment (above) to Anne. It includes fertility rates by education level for people having kids in the years 1965-1969. Check out page 7. Thanks for the article, Kevin. That’s one I’ll have to print out to read and digest—there is a lot of interesting information contained in it. One of our friends just had his first child three and a half years ago when he was 58. He’s the last straggler, but another friend had his first child around 6 years ago when he was in his early 50’s. I do think there’s a trend toward having children a little earlier again, but that is just based on some anecdotal evidence in the nephews on my husband’s side of the family and in some members of my profession who tend to start work a little earlier than most college grads (sign language interpreters).